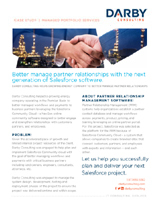 Darby Consulting helped a growing energy company implement and leverage the Salesforce Community Cloud to better manage workflows and payments to business partners such as land and royalty owners, engineers, attorneys, and more. Discover how Darby Consulting helped an independent oil & gas company operating in the Permian Basin to plan and implement a large portfolio of IT projects which saved them over $1.8M. If you no longer wish to receive our newsletter and promotional communications, you may opt-out of receiving them by clicking on the unsubscribe link in the footer included in each newsletter or communication or by emailing us at the reply address of the email or you may contact us by phone at 1-877-655-5382. 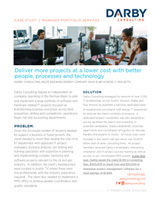 How can we support your IT projects? Darby Consulting is proud to be a recognized IT Management Consultancy by the Project Management Institute (PMI) – the world’s leading not-for-profit professional membership association for the project, program and portfolio management profession. © 2018 Darby Consulting, Inc.